The answer to that question, for us, is the Entrepreneurial Operating System, or the EOS model. The EOS model is the operating system derived from Traction, by Gino Wickman. I recommend this book to anyone in a leadership position. You can download a handful of materials at eosworldwide.com that walk you through implementation but I'll give my perspective here since there's a lot to comprehend. After all, we're talking about an operating system for your entire company. If you do decide to adopt this system I recommend sitting down with an implementer to make sure you get it right, but for the purposes of describing how EOS has built our commitment culture at Malartu, let’s talk about its key points. The obvious theme of commitment culture is to build a team that drives forward with a cohesive purpose and passion to achieve their mission. This starts with establishing a clear vision. According to the EOS framework, a company’s vision is a combination of core values and the company’s core focus. These core values and focus should be understood by every person in the organization, if they aren’t, the team won’t share that purpose and passion. Plain and simple. Once you have clearly articulated your vision, create a ten-year plan that outlines the lofty, pie-in-the-sky goal you're trying to reach. This is an illustration of your vision. If you stay the course and really solve the problem you've set out to solve, what does that look like in 10 years? How many employees? How much is the company making? What does your benefits package look like? Then, you set your three-year plan, which describes the strategies you’ll need to put in place to accomplish that lofty ten-year goal. From the three year plan we narrow down to a one year plan, and from there quarterly goals, or Rocks, as Wickman calls them. We typically set aside an entire day each quarter to set these goals, review our mission, and make sure the whole leadership team is on the same page. It sounds like a lot of time dedicated to something so hypothetical, but I promise it’s worth the investment. Finally, to round out the vision, you need to establish your unique marketing strategy. What is something that is unique to your business that wins over a specific market segment? This is a niche that everyone in your company understands and is proud to drive toward. This may evolve over time, but it must always be specific and unique. As I mentioned earlier, quarterly goals in EOS are referred to as ‘Rocks.’ The beauty of quarterly goals is that 90 days is the longest most humans can focus on specific issues without losing interest. In the quarterly meeting everyone on the team lists their respective things to accomplish next quarter that will put them on path to reach their one year, three year, and ten-year vision. Take this list and whittle it down to seven top priority goals. These will be your Rocks. Rocks are different from other objective frameworks in that they’re specific, attainable that quarter, and measurable. For example, a Rock for your CTO might be to release V2 of your mobile app this quarter. This Rock is obviously made up of many smaller tasks but it has a binary outcome and clear deliverable before next quarter's meeting. Assign each Rock to a person on your leadership team who will be in charge of realizing that Rock. Only one person can own each Rock, since splitting the responsibility inevitably leaves no one accountable. Each member of the leadership team should share these Rocks with their department and employees along with reporting on last quarter’s Rocks. From here, those departments can set their own underlying Rocks that lead to accomplishing the company-wide ones. By now I hope you see how this process builds from itself while also maintaining the company vision and commitment culture. To create the People Analyzer, list all your core values in one column, list your employees in one row, and mark if they exhibit this quality all of the time, some of the time, or none of the time. This exercise will paint a clear picture for who fits the culture you’re building and who doesn’t. If the answer is "no" to any of these, they aren’t right for the job. Plain and simple. Combining your learnings from these two exercises with an accountability chart (chart that maps out different departments of the business and where each person currently stands), will allow you to empower employees to take on leadership responsibilities and eventually entire leadership roles. This empowerment is a huge factor in building an environment for commitment culture to thrive. If employees know they have opportunity to grow within your company, they are far more committed to seeing the company succeed. In the second episode of our podcast, Scaling with Data, Ty Hagler of Trig Innovation and I briefly discuss a book that has changed both of our lives called Smarter, Better, Faster by Charles Duhigg. Among many helpful life hacks that I’ll get into in a later post, Duhigg discusses the concept of data disfluency and its effect on how we retain learnings, or not. The general idea of data disfluency is that tasks like taking diligent notes, working out a problem on paper, discussing data amongst your team, or even adding manual steps to an automated process not only helps us retain new learnings, but also encourages us to act on these learnings. It encourages us to actually change our behavior. It’s important to understand this idea of disfluency when we work with data in our business and in the EOS model, otherwise collecting data isn’t going to have any sort of positive effect, or worse, will cause negative effects. 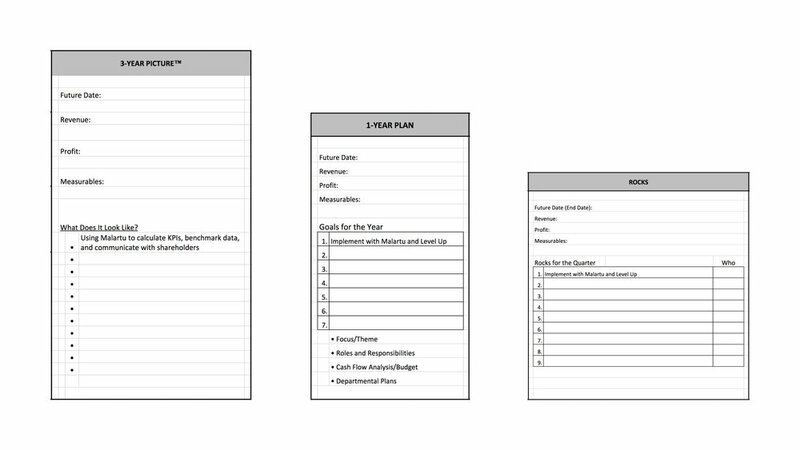 Generally, these scorecards hold people accountable, identify issues before they become huge problems, and create healthy competition among your leadership as well as their underlying departments. This weekly meeting will be the cornerstone of your commitment culture. It certainly is for Malartu. The meeting promotes accountability within your team and transparency in how you go about solving issues. As a helpful addition to this post we've included our Malartu L10 template for you to download and use how you wish. The process for solving issues within the weekly meeting is called IDS, which stands for Identify, Discuss, Solve. The general idea is that each member of your leadership teams lists all of the things that aren’t working the way they should since the last time you met. With all issues listed out, the team votes to choose three to discuss and solve that week. First, you identify what’s actually going on, since issues are often symptoms of something deeper. In our L10 template you will see that we get to the core of an issue by asking “Why?” five times. This helps us to truly uncover all the factors leading to an issue. Now that you've identified, discuss. Give everyone on your leadership team the chance to voice opinions about key issues and suggest ways to handle them. Finally, solve by assigning a solution, typically a concrete task that one person owns. When they complete this task, the issue should ideally disappear. This process is so important because it creates a safe atmosphere for everyone involved. The idea of a “safe atmosphere” is a bit more nuanced than you might think. In a study called "Project Aristotle," Google’s people analytics team set out to find what mattered most in building successful teams. At first guess, most people would assume that successful teams are made up of superstars with a strong consensus and just the right amount of work to pose a challenge. Project Aristotle, of course, found otherwise. Project Artistotle found that any team, including those made up of relatively average performers, can achieve great things by achieving a “safe” dynamic. So what does safe mean? It might be obvious, but safe teams consist of empathetic people - people who really care about the other people on the team. It’s important for the leader of every meeting to make sure each person’s voice is heard. — Abeer Dubey, director of Google’s People Analytics division. From a more strategic perspective, one of the worst things you can have are redundancies within your operation. An easy way to identify these is to have your leadership team list all the processes that are core to your business. Have everyone agree with the list and make sure they all use the same names to refer to the different processes. From here, each person in charge of each process documents important steps they take in completing the process. For example, the head of HR documents steps she takes when recruiting, orienting, or terminating employees. Review these sub-processes and you’ll find that some are redundant between team members. You might discover that there are areas that can be simplified with technology. After you clarify these redundancies and opportunities you can eliminate unnecessary tasks and simplify anything possible. From there, make sure the remaining processes align with your core values, to maintain that consistency needed for a strong commitment culture. Implementing EOS helped Ty’s team at Trig at a time when the wheels were starting to fall off. Eventually you have to put processes in place to build the company and culture you set out to build. The fly-by-the-seat-of-the-pants management style works early on in your company’s growth but will not build a sustainable company, and it absolutely won’t build a top-performing company. The EOS process is simple on purpose, its a distilled version of stuffy, complex corporate strategy that would put your employees to sleep if you tried to implement it. 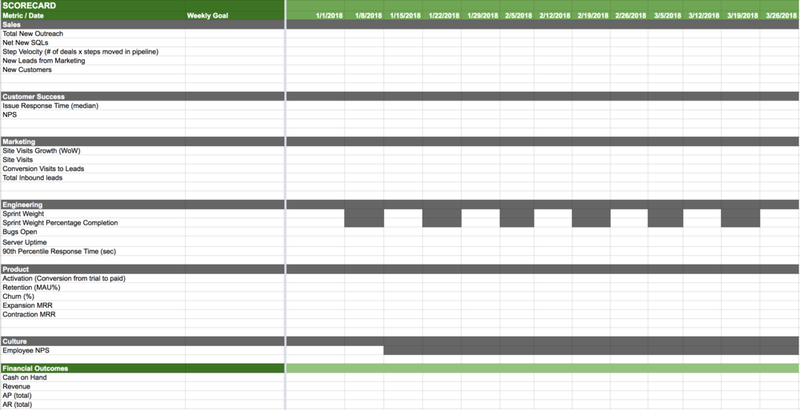 From accountability charts to rocks, to scorecards, we attribute everything about our culture to this system. Start exploring the EOS model for yourself.